When you think of gymnastics, you may think about people doing flips on a 4-inch-wide beam, bodies tumbling across the floor or men doing incredible feats of strength on the rings. Women's artistic gymnastics (often shortened to just "women's gymnastics") attracts the most participants and is generally the most well-known type of gymnastics. It's also one of the first tickets to sell out at the Olympic Games. The events: In women’s artistic gymnastics, athletes compete on four apparatus (vault, uneven bars, balance beam and floor exercise). Team: Five athletes are on a team. (In the future, that will change to just four.) In preliminaries, four athletes compete on each event and three scores count. In finals, three athletes compete on each event and every score counts towards the team total. Individual all-around: An athlete competes in all four events and the total score is added up. Individual events: An event champion is named on each apparatus. Watch it: The 2014 U.S. nationals for women's artistic gymnastics. This is the second most popular type of gymnastics in the United States and the oldest form of gymnastics. The events: Men compete on six apparatus: floor exercise, pommel horse, still rings, vault, parallel bars and horizontal bar (usually called high bar). 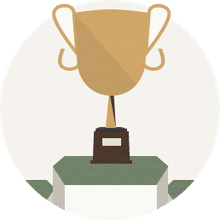 Competition: Olympic competition is held in the same format as women’s artistic gymnastics, with a team, all-around and individual events competition. The only difference is that the men compete in their six events, whereas the women compete across their four events. In rhythmic gymnastics, gymnasts perform jumps, tosses, leaps and other moves with different types of apparatus. This is currently a female-only sport in the Olympics. The events: Athletes compete with five different types of apparatus: rope, hoop, ball, clubs, and ribbon. Floor exercise is also an event in the lower levels of competition. Individual all-around: An athlete competes on four of the five events (every two years, one apparatus is rotated out) and the total score is added. Individual events: A gymnast is named the champion on each of the four apparatus currently in rotation. Group competition: Five gymnasts compete in two different routines. In one routine, all of the athletes use the same apparatus. In the second routine, the gymnasts use two different pieces of equipment (for example, three gymnasts will use the ball and two gymnasts will use the hoop). In trampoline gymnastics, gymnasts perform high-flying flips and twists on every bounce. This became an Olympic discipline for the 2000 Olympics. To add trampolinists to the quota allotted for gymnastics, artistic teams were reduced from seven team members to six. The events: A compulsory and a voluntary routine are performed in the Olympic competitions. Each consists of ten skills and is done on the same type of trampoline. 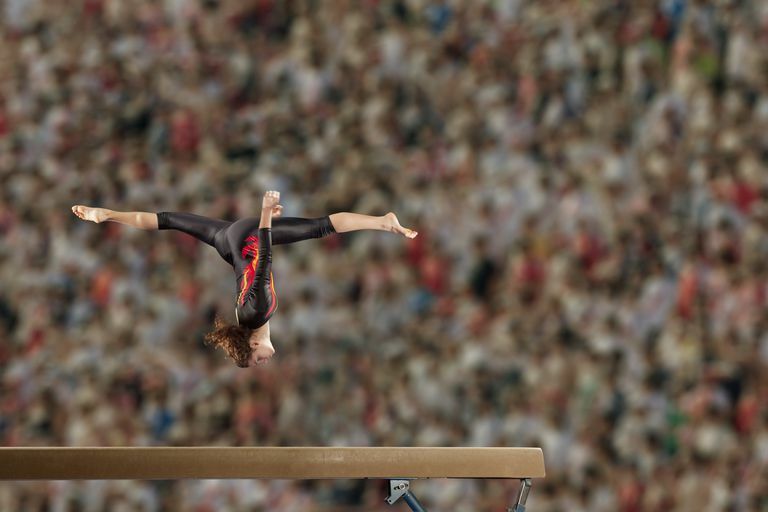 Double mini (gymnasts use a smaller, two-level trampoline) and synchronized (two athletes perform at the same time on different trampolines) are competitive events in the U.S., but not in the Olympics. Competition: Trampoline gymnastics includes an individual event for women and for men. There is a qualifying event to reach the medal round but the scores do not carry over. Power tumbling is performed on a spring runway much bouncier than the floor exercise mat used in artistic gymnastics. Because of its spring, athletes are able to perform very complicated flips and twists in succession. The events: All tumbling is done on the same strip. The gymnast performs two passes in each stage of the competition, with eight elements in each pass. Competition: Tumbling is not an Olympic event, but is part of the Junior Olympic program in the United States and is competed internationally as well. In acrobatic gymnastics, the athletes are the equipment. A two- to four-gymnast team performs all types of handstands, holds and balances on each other, while members of the team throw and catch their teammates. The events: Acrobatics is always performed on the same floor exercise mat. The events competed are men’s pairs, women’s pairs, mixed pairs, women’s groups (three gymnasts) and men’s groups (four gymnasts). Competition: Acrobatic gymnastics is not an Olympic event, but it is also part of the U.S. Junior Olympic program and is competed internationally. Group gymnastics in the United States is usually performed competitively under the name TeamGym. In TeamGym, athletes compete together in a group of six to 16 gymnasts. The group may be all-female, all-male or mixed. The events: In the U.S., participants in TeamGym compete in the group jump event (performances in tumbling, vault, and mini-trampoline) and the group floor exercise. Competition: TeamGym is not an Olympic event, but is competed in the United States and abroad in invitational meets, as well as local, regional, national and international competitions.